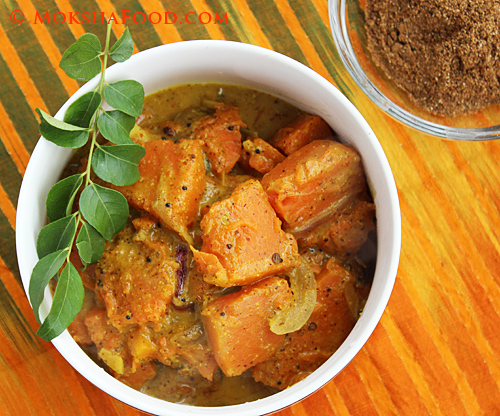 Sri Lankan Pumpkin Curry or Wattaka kalu pol! We love Sri Lankan food for its spicy red curries. 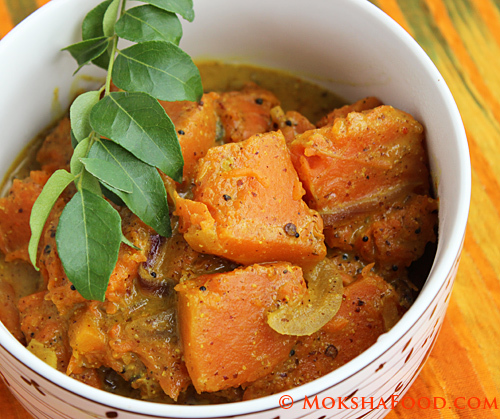 But this recipe is refreshing different with the heat and subtle bitterness from mustard and fenugreek seeds complimenting the creamy coconut milk. It takes the mild and sweet Pumpkin onto a roller coaster ride of complex flavors. The recipe is a multi-step process with lots of roasting and grinding but the final result was worth all the effort. 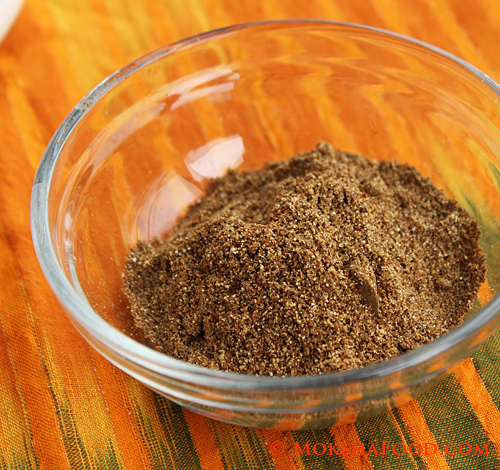 I also made the roasted Sri Lankan Curry powder from scratch to get as close to the authentic flavors as possible. The flavors were so addictive that it left my mustard paste loving Bengali Husband asking for more. This recipe is definitely a keeper. In fact we felt the spices and flavors would also go well with a hearty fish like carp, red snapper or mackerel. Roast the rice and coconut in a pan till golden brown. Take care not to burn. Cool and grind coarsely. In a large saucepan heat some oil in it. 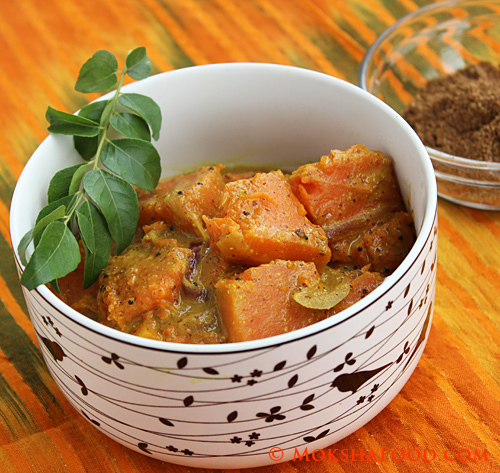 Temper with mustard seeds and fenugreek seeds. When they pop, add in the onions, green chilies, garlic, curry leaves and saute till they change color slightly. In a large bowl take all the pumpkin pieces. Add turmeric powder, roasted curry powder, chili powder, ground mustard paste and salt. Mix well. Drop all these seasoned pumpkin pieces into the saucepan. Add in the coconut milk and some water, enough to make a gravy. Cook till the pumpkin is almost done. Now add the ground rice-coconut mixture and cook a few more minutes. Add sugar and taste to balance the flavors. First roast the raw rice till brown. Keep Aside. Roast each spice separately till it changes color. Be careful not the burn the spices. When you roast mustard seeds, put a lid on the pan as the seeds would pop all over the stove and may also hurt you. Cool the spices and grind to a fine powder. Use as required for Sri-lankan recipes.